Confederate States of America The Statutes at Large of the Confederate States of America, Commencing with the First Session of the First Congress; 1862. Public Laws of the Confederate States of America, Passed at the First Session of the First Congress; 1862. Private Laws of the Confederate States of America, Passed at the First Session of the First Congress; 1862. 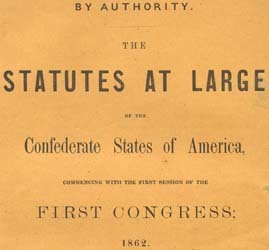 The Statutes at Large of the Confederate States of America, Commencing with the First Session of the First Congress; 1862. Public Laws of the Confederate States of America, Passed at the First Session of the First Congress; 1862. Private Laws of the Confederate States of America, Passed at the First Session of the First Congress; 1862. Richmond: R.M. Smith, Printer to Congress, 1862.